Get to know the personalities behind the Microphone! Chris Koval is the driving force behind Future Sounds Disc Jockey Service. His entertainment background began in television in 1985. He worked in sound and lighting production for several bands and in clubs during the late 80's and 90's. He polished his technical skills through work in radio production and commercial editing. Koval worked as an on-air personality for several stations throughout Texas for 10 years. You can listen to some audio samples at the bottom of this page. His experience with the wedding industry began in early 1993 and this led to the formation of Future Sounds in 1998. Since that time, he has focused primarily on wedding receptions averaging 50 per year but also works with schools and company events averaging an additional 40 events per year. Koval is well-known, a respected professional and business in the wedding industry as well as in the mobile entertainment industry. He specializes in more than playing music; his specialty is providing his clients with a complete entertainment experience. This experience shared spans over 30 years and over 3500 events. Preparation, organization and coordination are all part of the process that has led to the success for Chris Koval and Future Sounds DJ Service L.L.C.. Academically, Chris worked for 15 years in higher education. Chris has a B.A. in Technical Communication and a M.Ed. with a focus in Instructional Technology. You can find Koval on LinkedIn to view his academic and professional achievements. He is also an active member of the International Live Events Association (ILEA) serving as VP of Communication, an active member of the Alamo Area Hospitality Association (AAHA) serving as the 2019 President and an active member of the National Association of Catering and Events (NACE) assisting the fundraising committee. Why choose Chris Koval and Future Sounds? He and his company are well-rounded and grounded! 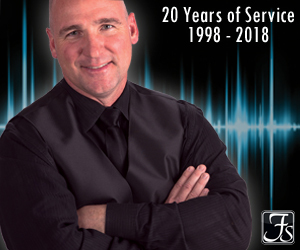 Koval has been doing businesses as Future Sounds since 1998, that is 20 years of continued business and service to the industry and our clients! . He has a proven positive record of accomplishment and longevity in his trade. He has a successful business, industry experience, and technical knowledge. He has the ability to adapt, apply, and implement tools and equipment at a moment’s notice. He has a passion that drives him to attain success and show it in his work and in his trade. In addition to his 30 years of experience in the entertainment industry in all facets of the field, Koval supports his trade with an educated foundation. Koval is goal oriented and can communicate! He can direct, manage, and collaborate with individuals, groups and cultures. Large or small, Chris Koval has the ability to make your event a success.